When the Layout Tool opens, click on the desired input tab to open that section. Typically for first time visits, go through the input sections top to bottom. Once familiar with the tool operation, you can skip many of the input items and get results in seconds. The tool will compute instantly when it has enough input. The graphics are interactive so it's easy to just click and drag any graphic, or use the menus. 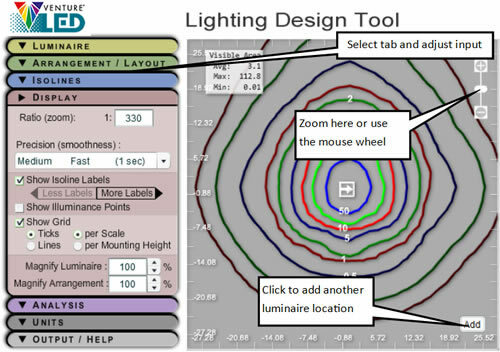 When clicking the Light Design Tool icon adjacent to your chosen product on the Venture website, the photometric file is automatically loaded into the layout tool. 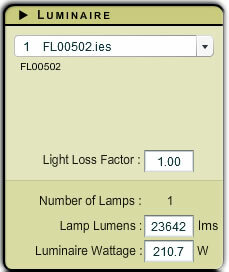 Light Loss Factors and lumen proration are also possible from this section. The Luminaire Wattage is pulled from the photometric file; this should be total connected load for accurate power density calculations. 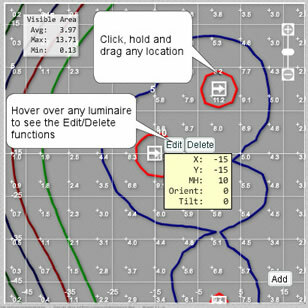 The Arrangement and Layout section of the Outdoor tool is very powerful allowing its use as a template generator or layout tool. 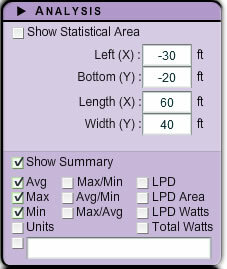 To use the Outdoor tool as a simple template generator (one pole arrangement), set the arrangement from the pull down menu and leave the Layout and Spacing section blank. 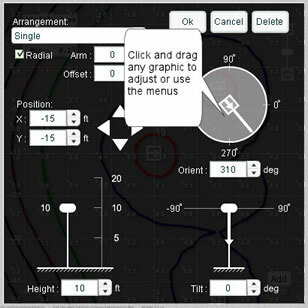 To use the Outdoor tool as a layout tool, select the Arrangement for the majority of your locations from the menu. 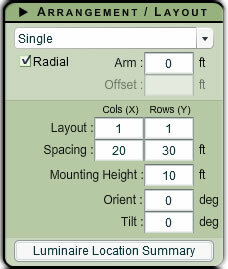 If you want a uniform luminaire position (array) to begin, enter the Column and Row quantities and the spacing between. This is simply a starting point, as the layout is completely interactive. You can add different arrangements, change, move and manipulate aiming in any way from the graphics area using the mouse. 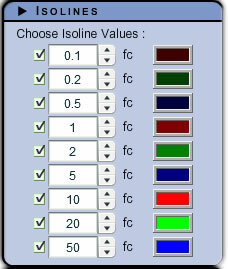 Click in the colour cell to change the colour if something else is preferred. The Scale can be set in this section. However, interactive zooming changes the scale (fixed plot size). 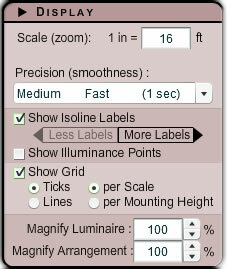 Interactively zoom using the mouse wheel or the Zoom indicator in the upper right corner of the graphics area. Panning is also possible by holding down the mouse wheel as you move. 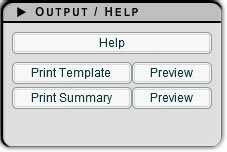 The Output and Help section offers printing options.